Having to deal with pests in your home or commercial building is less than ideal. While you may want to opt for the more affordable DIY methods that promise a pest-free home, there are so many reasons that you should not settle for poor services in the hopes of saving money. Though it can be incredibly tempting, you should always choose to work with a professional pest control company. For the times where price is something that you’re concerned about price, it’s good to remind yourself of the factors that are considered when pricing out services. 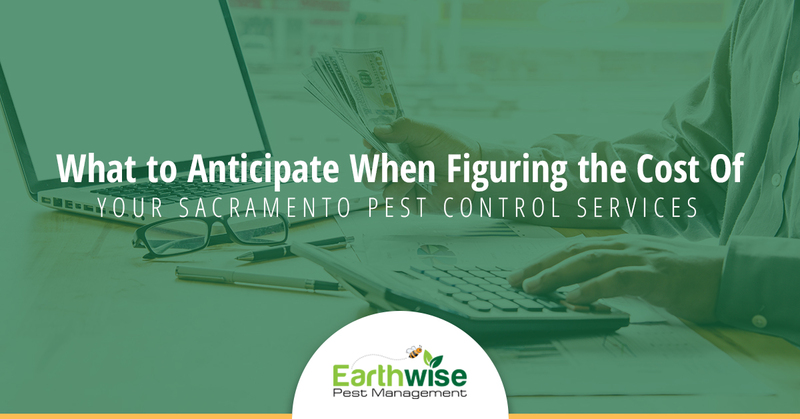 Keep reading to learn more about what you can anticipate when figuring the cost of your Sacramento pest control services. The average cost of pest control services is going to vary on a few different things. On average, the price for pest control services range anywhere from $100 to $500. Depending on the maturity of your infestation, the type of pest that you’re dealing with, and the treatment that we suggest, you can anticipate a range of prices. At Earthwise Pest Control, we strive to provide you with the absolute best price for your services so that you can enjoy quality results for reasonable prices. Here are a few of the things that we factor into our pricing when we provide you with a service. One of the most critical factors that we’ll have to take into consideration when factoring pricing is the type of pest that you’re dealing with. While all pests are equally unpleasant to find in your home or commercial building, they are not created equally. Bed bugs, for example, require much more treatment to remove than rodents or silverfish would. While the pest itself isn’t going to factor into the price, it is going to determine the method of treatment that we choose to use, and that could, in turn, alter the price. Another significant part of the decision in treatment is going to be the maturity of the infestation. Removing a few pests from a house can be quite easy and finding suggestions to ensure that they don’t return will be the primary focus. On the other hand, having to handle a full-blown, mature infestation that’s created damage and has built a colony is going to be a little bit different. These are often harder to remove and will require additional efforts when it comes to ensuring that they don’t return. At the end of the day, the maturity of the pest at hand is going to determine quite a bit of the treatment that’s used, what efforts need to be made in ensuring pests don’t return, and what type of follow-up work is going to need to be done. Professional services cost more than the standard DIY services do, but for good reasons. It’s not simply the title of “professional” that you’re paying for, but the results that you get to enjoy. When you look at the cost of your pest control services, remind yourself that you’ll be able to enjoy the following when you choose to work with a professional. Without a doubt, the one thing that you’re going to enjoy the most is the long-term results that you get when you hire a professional pest control company. Most people choose DIY pest control methods because they’re more affordable, but they only provide short term results to the user. Rather than spend money time and time again on pest control methods that don’t work, consider finding a company that can provide you with long-term results so that you don’t need to continue dishing up money. While it may be more money up front, you won’t have to worry about crossing paths with pests time and time again. In order to achieve long-term solutions, you need to have the knowledge to know what it is that’s allowing for the pests to thrive there in the first place. While having years of experience removing pests is beneficial, it’s the experience and knowledge that allows for pest control companies to yield such high-quality results. When you hire a company, you are getting all of their knowledge of the pest and how to best treat an infestation. Worth much more than any quick fix. The most valuable part of hiring a pest control company is the professional equipment and treatment that they will use on your infestation. The most important part of treating an infestation is that it’s taken care of and that you don’t have to worry about it later on. With the proper equipment and the right treatment, any infestation should be taken care of. Moreover, you should have answers and guidance on how to avoid an infestation in the future. This is what a professional should be able to provide you with. Price is definitely something you should take into consideration, but the quality of the services that you receive is going to be much more important. Earthwise Pest Management offers free consultations to our customers. Our goal is always to provide customers with the best experience and the long-term results that they are looking for, without the cost being a problem. Reach out to our team today to schedule your free consultation. A member of our team will happily help with any questions, concerns or inquiries that you may have.